How are infant brain bleeds (intracranial hemorrhages) treated? How are infant brain bleeds (intracranial hemorrhages) treated? How are brain bleeds (intracranial hemorrhages) treated? Treatment of intracranial hemorrhages (brain bleeds) depends on the type and severity of the injury. Because brain bleeds often result in permanent brain damage, treatment of intracranial hemorrhages is often supportive and therapeutic in nature. However, surgery may be necessary to manage certain intracranial hemorrhages, such as subdural hematomas. If an infection is present due to a brain bleed like a cephalohematoma (cephalhematoma), antibiotics are used. In order to promptly begin treatment, it is critical that medical professionals diagnose intracranial hemorrhages as soon as possible. Due to the potential for severe brain damage that can be caused by hemorrhages–especially subgaleal hemorrhages–early recognition and management of brain bleeds is essential. Babies who experienced a difficult delivery, particularly if vacuum extractors and forceps were involved, must have continuous monitoring and frequent vital sign assessment. Medical professionals should monitor hematocrit (red blood cells) frequently and, in most cases, measure the size of the baby’s head. Head imaging and coagulation (blood clotting) studies should also be done. When a baby experiences blood loss as the result of an intracranial hemorrhage, treatment includes giving the baby blood and other therapies to increase blood volume and blood pressure. This includes packed red blood cells, fresh frozen plasma, and normal saline administration. In cases of a subdural hematoma, surgery to remove excess fluid and blood may need to be performed to decrease pressure inside the brain. Emergency surgery is needed when there is brainstem compression caused by bleeds in parts of the brain that don’t have as much plasticity (ability to recover) as other parts. When seizures occur due to brain bleeds, they should be treated with antiepileptic drug therapy, and phenobarbital should usually be the initial drug. Seizures must be detected and treated as soon as possible because they can cause brain damage; the more frequent the seizures and the longer the duration, the higher the potential for permanent brain injury such as cerebral palsy. Was your loved one diagnosed with an intracranial hemorrhage after birth? If so, we encourage you to contact our legal team for a free consultation. During this meeting, our team of birth trauma attorneys will help you understand your loved one’s injuries and how they happened. Should you have ground for a birth injury case, we will discuss your legal options with you. 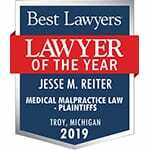 Contact Reiter & Walsh, P.C. in any of the following ways to start your free case review.